Description: From a set of 12 landscapes. State: Only state. Ref: Undescribed. Very rare print! 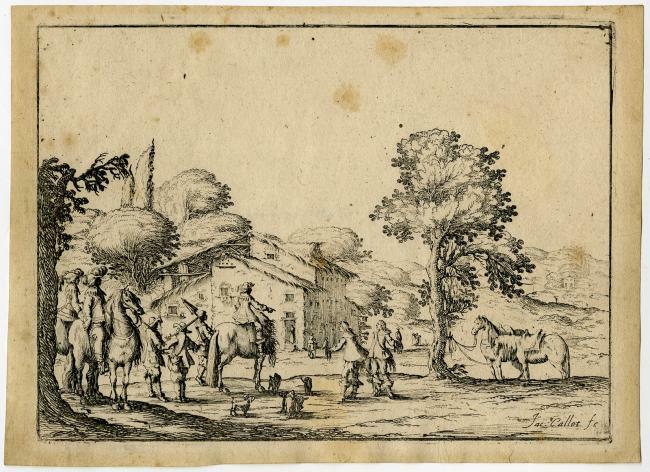 Artists and Engravers: Made by 'Ercole Bazicaluva' after 'Jacques Callot'. Ercole Bazicaluva / Bazzicaluve (born ca. 1600 in Pisa) was an Italian engraver. He was a student of Giulio Parigi in Florence. He was a friend and influenced by Callot. His limited work is scarse. Jacques Callot (Nancy 1592-1635) was a famous baroque printmaker and draftsman from Lorraine / present day France. He was active in Italy employed by Cosimo II de Medici until 1621. He is an important figure in the development of the old master print and highly popular. Author: Ercole Bazicaluva / Bazzicaluve (born ca. 1600 in Pisa) was an Italian engraver.